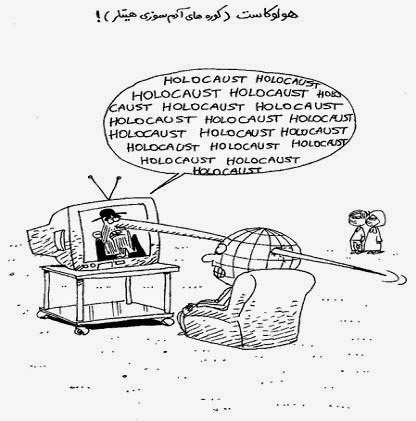 Wayki Wayki Blog: The Emperor of all lies (Part 1): The Holocaust 6 Million. The Emperor of all lies (Part 1): The Holocaust 6 Million. The Holocaust is THE paradigm for Jewish suffering, and is treated as being beyond examination and scrutiny. Questioning the official Holocaust narrative is at best, socially unacceptable, leading often to social exclusion and discrimination, and is even illegal in 13 European countries. I implore the reader to let go of group think, school education, nationalism, media buzzwords, and political labelling. If you can't do this, please stop reading. I have no hatred towards any racial or religious groups, and don't care for left or right theatrical politics, so these are not the motivation for this blog. But If zionist media can lie about 911, 77, Diana, Gaza, Central banks, toxins, then all is open to question. Most people's knowledge and belief system regarding The Holocaust comes from a western school or from Hollywood based movies. So few have actually studied the core evidence. So what actually does the word Holocaust actually mean? The Oxford Dictionary Online tells us the following: . 1.1 (the Holocaust) The mass murder of Jews under the German Nazi regime during the period 1941-5. More than 6 million European Jews, as well as members of other persecuted groups, were murdered at concentration camps such as Auschwitz." So there it is in the Oxford dictionary, 6m Jews murdered at camps, mainly Auhswitz, just as our schools and TV told us. Strangely, the number of 6 million Jews was used in the mainstream press many times long before WW2 even started, is this a symbolic number? 6,000,000 in numerology reduces to 6, which is the letter VAU, which translates to Nail or Hook. The esotric meaning of VAU is nailing thro (hooking) all levels of correspondence, and also means physical unification and unity. It was widely reported during World War One ( 1914 to 1918 ) that the Germans and their allies were using gas chambers to kill thousands of prisoners. However, in 1919, after the end of the War British Prime Minister Stanley Baldwin admitted in Parliament that it had been propaganda and no such gas chambers had existed. He also apologised publicly to the German People for this racist slur on them. During World War One the British Government had agreed with leading Jews that they would support a Jewish homeland in Palestine in exchange for the powerful Jewish lobby in America getting the USA to join the Allies. This led to the Balfour Declaration being made by the British Government promising the Jews a homeland in Palestine. After World War One the British Government were unable, or unwilling, to make good on this promise. From 1919 onwards the Jews claimed 6 million Jews in Europe were under threat from extermination unless they got a homeland in Palestine. This was 14 years before the Nazis came to power and 24 years before the alleged Holocaust started. There was a total population of roughly 6 Million Jews in the whole of Europe when the WWII broke out. There were about a half million in Germany. The 6 million Jews Holocaust story centres around a concentration camp called Auschwitz, so lets focus here. The Auschwitz camp complex was set up in 1940 in what is now south-central Poland, and large numbers of Jews were deported there between 1942 and mid-1944. Scholars do not dispute the fact that large numbers of Jews were deported to the camp, or that many died there, particularly of typhus and other diseases. But the compelling evidence they present shows that Auschwitz was not an extermination center and that the story of mass killings in "gas chambers" is a myth. Today no reputable historian, not even those who generally accept the extermination story, believes the 6m figure. Israeli Holocaust historian Yehuda Bauer said in 1989 that it is time to finally acknowledge the familiar six million (at Aushwitz) figure is a deliberate myth. In July 1990 the Auschwitz State Museum in Poland, along with Israel's Yad Vashem Holocaust Center, suddenly announced that altogether perhaps one million people (both Jews and non-Jews) died there. Neither institution would say how many of these people were killed, nor were any estimates given of the numbers of those supposedly gassed. One prominent Holocaust historian, Gerald Reitlinger, has estimated that perhaps 700,000 or so Jews perished at Auschwitz. More recently, Holocaust historian Jean-Claude Pressac has estimated that about 800,000 persons, of whom 630,000 were Jewish, perished at Auschwitz. A key Holocaust document is the "confession" of former Auschwitz commandant Rudolf Höss of April 5, 1946, which was submitted by the U.S. prosecution at the main Nuremberg trial. Although it is still widely cited as solid proof for the Auschwitz extermination story, it is actually a false statement that was obtained by torture. The Höss "affidavit" further alleges that Jews were already being exterminated by gas in the summer of 1941 at three other camps: Belzec, Treblinka and Wolzek. The "Wolzek" camp mentioned by Höss is a total invention. No such camp existed, and the name is no longer mentioned in Holocaust literature. The head of the SS camp administration office sent a directive dated Dec. 28, 1942, to Auschwitz and the other concentration camps. The Facts: It takes about 70 minutes (according to one furnace manufacturer's spec sheet, see  ) to cremate a body even today. This is a burner of 400KW. If each crematory furnace were to cremate 20.6 bodies in every 24 hour period running 7 days a week, then to handle 20,000 bodies a day would require more than 971 furnaces running non-stop, AND sufficient fuel to keep them all operating. And all this, in a Germany that was always short on fuel? It seems most died from the wartime typhus epidemic and severe malnutrition-induced illness, work and starvation. It had originally been claimed that "over 4.5 million" of the "six million Jews" had been "gassed" there. This figure went through many, many permutations and revisions by the JEWS THEMSELVES until about 1985, when Dr. Francisek Piper - the very one whom the American Jew, David Cole, interviewed in his now famous video - the one in which Piper admits that the "gas chamber" that was always shown to the tourists there - was actually built in 1947! - two years AFTER the war was over. When the Red Cross interviewed thousands of freed camp inmates at the end of the war, asking whether they had witnessed alleged ‘gassings,’ the response was universally negative. According to IRC document #9925, June, 1946: "The detainees themselves have not spoken of them." In his monumental six volume 'The Second World War' Sir Winston Churchill, British wartime Prime Minister, never makes any reference to gas chambers or a planned mass extermination of European Jews. This is despite the fact he goes in to great detail about virtually every facet of World War Two including many atrocities committed by the Nazis. Which country's government has benefited from it most? Who actually won WW2 (came out of it best)? Where does the director of Shindler's List come from? Who has more millionaires in their population as a percentage compared to other nations? Who gains over $3bn American tax money to invest into high-tech military weapons? 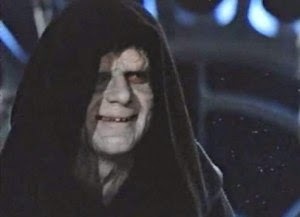 Who since the late 40's has slowly began to control western banks, media, hollywood, and many large corporations? If some people were capable of such a monstrous and evil lie, they would be probably be capable of something like extermination and other lies - who is performing a form of genocide in the world today (Gaza) and trying to gain support by lying in the media? Beware of those judging someone a "denier" who simply questions official history. This shows how strongly people are conditioned that they can't even apply the most basic critical thinking. If you want to look into millions of civilians being exterminated around WW2, look the other way towards the German civilians between 1945-1950....For more information on this topic see books by the following authors: James Bacque (Other Losses) (Crimes and Mercies), Alfred M. de Zayas (Die Wehrmacht-Untersuch ungstelle) and (The Nemisis of Potsdam), Guido Knopp (Die Gefangenen), Erich Kern and Karl Balzer (Allierte Verbrechen and Deutschen). A similarly important historical document is the book titled (Alliierte Kriegsverbrechen) which translates to "Allied War Crimes", and "Gruesome Harvest." 1. 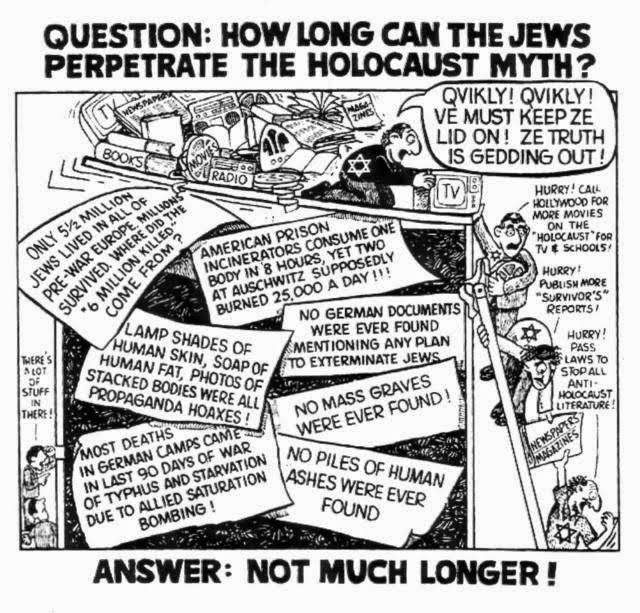 Y. Bauer, "Fighting the Distortions," Jerusalem Post (Israel), Sept. 22, 1989; "Auschwitz Deaths Reduced to a Million," Daily Telegraph (London), July 17, 1990; "Poland reduces Auschwitz Death Toll Estimate to 1 Million," The Washington Times, July 17, 1990. 2. IMT blue series, Vol. 16, p. 529-530. (June 21, 1946). 3. Nuremberg document 3868-PS (USA-819). IMT blue series, Vol. 33, pp.275-279. 4. Rupert Butler, Legions of Death (England: 1983), pp. 235; R. Faurisson,The Journal of Historical Review, Winter 1986-87, pp. 389-403. 5. Nuremberg document NO-021. NMT green series, Vol. 5. pp. 384-385. 6. Nuremberg document NI-11696. NMT green series, Vol. 8, p. 606. 7. Testimony in Toronto District Court, March 28, 1988. Toronto Star, March 29, 1988, p. A2. 8. Sylvia Rothchild, ed., Voices from the Holocaust (New York: 1981), pp.188-191. 9. Walter Laqueur, The Terrible Secret (Boston: 1981), p. 169. 10. Nuremberg document PS-2171, Annex 2. NC&A red series, Vol. 4, pp.833-834. 11. Canadian Jewish News (Toronto), April 14, 1988, p. 6. 12. The Leuchter Report: An Engineering Report on the Alleged Execution Gas Chambers at Auschwitz, Birkenau and Majdanek (Toronto: 1988). Available for $17.00, postpaid, from the IHR. 13. The Globe and Mail (Toronto), Feb. 12, 1985.